Handsome white and black Arkan Angel came to us on May 16th from Columbus following rehab for a broken leg - and went into his new home the same day! 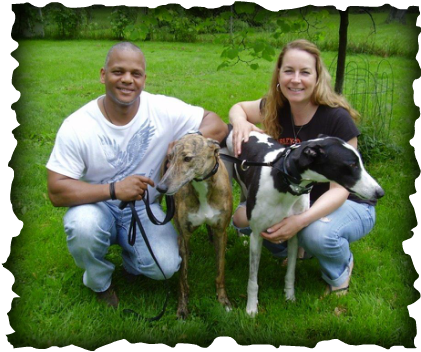 Tammy and Ben of Springfield brought Lia to our Young's Jersey Dairy Meet & Greet the previous week and saw how happy she was with the other greyhounds, so they decided to add to their family. Arkan is a very nice match for Lia, and really likes his new humans. We hope to see all of them at upcoming GAGC events.